Members of the U.S. military make significant sacrifices in order to serve their country. Yet, many dedicated U.S. citizens and lawful permanent residents are either prevented from serving in the military or their service is considerably limited because of who they love and who their family members are. Active service members are often stripped of their security clearances, unable to advance up the ranks, and threatened with discharge from service if they have undocumented spouses, parents, and children. Even more shocking, just recently the Pentagon confirmed that it plans to bar American citizens and lawful permanent residents from enlisting in any branch of the U.S. military – the Navy, Marine Corps, Air Force, Army, and Coast Guard – if those citizens and permanent residents have undocumented spouses and children. The Pentagon confirmed that the reason for this rule is that citizens and permanent residents who have undocumented spouses and children living with them are thought by the Pentagon to be committing the crime of “harboring.” Obviously, there may be security reasons behind these policies; however, there must be a way to both protect the security of the United States while also assisting and honoring U.S. citizens and permanent residents who want to dedicate their lives to serving this country. U.S. citizens and lawful permanent residents should not be faced with the impossible choice between serving their country and being with the ones they love. For these reasons, there is concern that members of the U.S. Armed Forces or Selected Reserve of the Ready Reserve face stress and anxiety because of the immigration status of their family members In the United States. Military preparedness can be adversely affected if active military members, who can be quickly called into active duty, are worried or anxious about the immigration status of the spouses, parents, and children. Veterans, who have served our country and made significant sacrifices for the United States, may also face stress and anxiety because of the immigration status of their family members. In response to these concerns, the Obama Administration and the President’s previous Secretary of Homeland Security, Janet Napolitano, attempted to address some of these issues by applying existing legal remedies in ways that assist members of the U.S. military, veterans, and their families. One of these policy initiatives revolves around the legal mechanism of Parole in Place. Pursuant to INA § 245(a), adjustment of status to that of lawful permanent resident is only available to an individual “who was inspected and admitted or paroled into the United States.” Thus, an individual who has entered without inspection is ineligible to become a permanent resident while physically present in this country, even if married to a U.S. citizen. Instead, the individual must depart the U.S. in order to obtain an immigrant visa at a U.S. consulate abroad. However, such a departure from the U.S. consequently renders the individual inadmissible to reenter this country for ten years after the date of departure. As a result, the process to obtain permanent resident status for an individual who entered the U.S. without inspection affects not only that individual, but also, his or her U.S. citizen or permanent resident family members. This situation presents more serious, unique hardships on military families, which is why the Department of Homeland Security (“DHS”) identified Parole in Place (“PIP”) under INA § 212(d)(5)(A) as an administrative mechanism that could avoid imposing such difficult circumstances on military families. In a letter to Congress dated August 30, 2010, the Secretary of Homeland Security identified several tools that the Department utilizes “to help military dependents secure permanent immigration status in the United States as soon as possible.” Among these tools, the Secretary identified PIP as a tool “to minimize periods of family separation, and to facilitate the adjustment of status within the United States by immigrants who are the spouses, parents and children of military members.” PIP is especially significant in the support it provides to military families during wartime. It is a purely discretionary remedy that takes into account the negative impact that the separation of family members may have on a military member’s morale, readiness, or ability to complete his or her service. Despite this clearly articulated policy from the Secretary of Homeland Security, however, some U.S. Citizenship and Immigration Services (“USCIS”) offices, the agency within DHS responsible for adjudicating applications for immigration benefits, questioned whether PIP should be granted to certain family members of active duty members of the U.S. Armed Forces, individuals in the Selected Reserve of the Ready Reserve, or individuals who previous served in the U.S. military. Similarly, even when PIP was granted to spouses, parents, and children of U.S. military members and veterans, some USCIS offices questioned the legal authority to actually grant adjustment of status to these individuals based on their PIP. These questions led to inconsistent adjudications of PIP requests and adjustments of status based on PIP throughout the country. Ultimately, USCIS decided that it needed to clarify its policy regarding these two questions by issuing a policy memorandum. In response, many USCIS offices put such PIP requests and PIP-based adjustment of status applications on hold, awaiting the clarified policy from its Office of the Director. Accordingly, many members of the U.S. military, veterans, and their families have been waiting – some for several years – for their family members’ PIP requests and PIP-based adjustment of status applications to be adjudicated. This resulted in revoked security clearances and the inability to advance for many military members, as well as negative impact on service members’ morale and readiness to serve. Thankfully, the waiting is now over. In a policy memorandum dated November 15, 2013, the Office of the Director for USCIS clarified the agency’s policies regarding PIP. 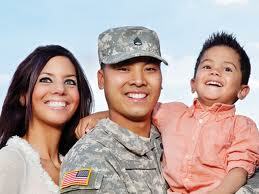 First, USCIS confirmed that PIP is a discretionary remedy available to spouses, parents, and children of active members of the U.S. Armed Forces, individuals in the Selected Reserve of the Ready Reserve, and individuals who previously serviced in the U.S. Armed Forces or the Selected Reserve of the Ready Reserve. Second, after a lengthy legal analysis and discussion of the specific language of the Immigration and Nationality Act, USCIS verified that a grant of PIP cures inadmissibility for being present without having been admitted or paroled and for being one who “arrives” at an undesignated time and place. This means that an individual who entered the U.S. without inspection, but subsequently received PIP, is not inadmissible for these grounds. Consequently, if he or she is otherwise eligible to adjust status, he or she may do so while present in the U.S., thus avoiding lengthy separations and negative impacts on the U.S. military member’s morale, readiness, and ability to serve. As stated by Secretary Napolitano in her letter to Congress, the purpose of PIP is “to minimize periods of family separation, and to facilitate the adjustment of status within the United States by immigrants who are the spouses, parents, and children of military members.” USCIS has now reaffirmed that purpose and will move forward in adjudicating all of the PIP requests and adjustment of status applications that have been placed on hold. Many members of the U.S. military will no longer have to wait with revoked security clearances and the inability to progress in their military careers. Their ability to complete their service to our country will no longer be negatively impacted. They will no longer be faced with the impossible choice between their service to the United States of America and their family members. We commend USCIS for making these important clarifications and for doing its part to ensure that our military members are ready and able to complete their service and our veterans are cared for and honored for their service to our country. This post was written by Dree K. Collopy.